Have a "Dance-Over" party so you and your BFFs can choreograph and perform the coolest, most creative dances ever made! 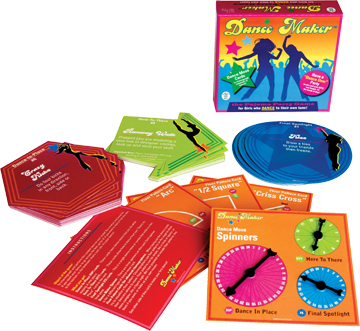 Use the Dance Maker Spinner to choose your moves. Place your moves all around the room (even on the bed!) Once you're happy with your dance layout, spin one more time for the Final Spotlight Card. Now it's time for you and your BFFs to PRACTICE, PERFORM and APPLAUD! Dance Maker has enough dance moves to choreograph hundreds of unique dances. Created by a REAL Dance Teacher!